Seafood has taken a bit of a beating in the news here in Vancouver lately (!) so I thought I'd give local businesses a boost and headed to the Lobsterman down on Granville Island to pick up some Saltspring Mussels for New Year's lunch. No need to worry about that business though it was slammed with happy shoppers. 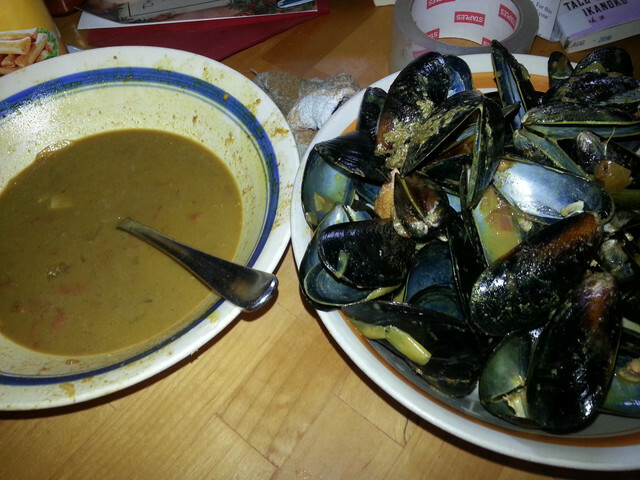 Anyway as you can see it was Mussels in curry with probably too much Garlic but who's counting. I like the before and after bowls... Yummy, belch!